I found a wonderful quote on Quote Garden that goes likes this: How beautiful a day can be when kindness touches it!! ~George Elliston So I hope that my blog entry gives you a touch of kindness. I made this card using a Tim n Shell's Digi-Downloads image. This image is so sweet. I love her outfit because it can either be a day outfit or pajamas. I chose to make them look like pajamas, I want to give the idea that she's just awakened and stepped outside to enjoy the beautiful scenery and the birds song. Appreciating the One True Artist. I used the sketch from Friday Sketchers challenge blog - it's such a lovely sketch and their Design Team created some beautiful cards with it. The quote I shared above wouldn't go on the front of my card, so it's the message inside. And speaking of challenge blogs, it's time to announce what I've been hinting at lately. I have decided to try my hand challenges. 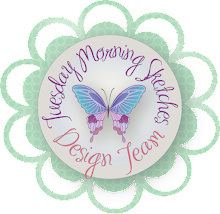 I created a challenge blog called Tuesday Morning Sketches and I will launch on July 7th. I've got some great companies lined up to sponsor each week with great prizes. I do hope you'll join me. Hello! Welcome to another week - it's always great when you start off with a little Sunshine. 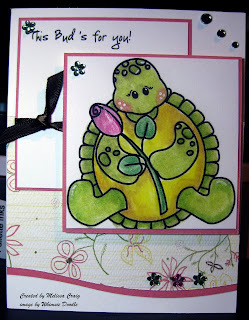 This week, the DT is using a sketch challenge from Splitcoast Stampers (#234). I flipped the sketch and made this a great card for any basketball fan. When I colored this little guy, I didn't color for a particular team. My hopes is that he'll fit in somewhere, even if just to give another child some encouragement. He is colored with Prismacolor Markers. I used some basketball themed paper that I got from Michaels. The sentiment is from a Papertrey Ink set. This is such a simple card - gotta love simple, especially when there's so much chaos in my house. Between 3 kids, an extra teenager, a puppy and senior dog, seven loads of laundry.... well you get the picture. 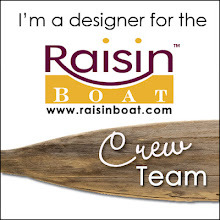 I have another card to share with you because I found another great challenge site. It's called Sketch and Stash Challenge Blog, they're challenges are posted on Mondays, so I'm getting this in under the wire. But it also accomplishes my Dustin Pike card swap cards. I love this image! It's so funny - but I'm not sure if the dog ripped his arm off or found it. LOL He's a sweet and playful little guy, so I think he found it and is excited to return it to it's owner. My base is Neenah Classic Crest Solar White cardstock, then I used Brocade Blue with the Traffic Jam Cuttlebug embossing folder. I then created my own photo corners, I knew I would not be able to create them perfectly, so their randomness fits right in with the embossing. I colored the image using Prismacolor pencils and Gamsol. Someday I'm going to figure out what the secret is to blending all the coloring lines out. I created the sentiment on the computer. I hope you enjoy both my posts today. Thanks for stopping by. Edit - Whooopeee - I just learned that Digital Tuesday Challenge blog's newest challenge is a Dustin Pike image. Yaaayyy, another challenge entry! Good morning. It's a very over-cast day outside, but it's nice and cool which is a bit of a relief from yesterday's heat. I told you yesterday that I had another MSB new release to share with you. This is another Doodle Girl, which I really enjoy that particular line. We never have enough birthday cards do we! This is All Together and her arms are to embrace anything you put in them. I gave her a cupcake to hold. I used a little cupcake image from a Papertrey Ink set, Limitless Labels. The b/w background paper you've seen me use before, it's free digi-paper from Close to my Heart. The pink background paper is from a monthly kit, so I'm not sure what it is. It's cute. The sentiment is also from Papertrey Ink. Thanks for stopping by. Enjoy your Sunday. Hi everyone! Happy Saturday! I hope you're doing well - we had a heck of a thunderstorm roll thru here last night. Whew! I have to admit that I dropped the new release ball! I completely forgot to post my cards that feature some of the newest digi's from Modern Sugar Blvd. that were released yesterday. And it's also time for a new challenge - that I am on time for. First let me share one of my cards that I really loved putting together. No, it's not because I'm anxious for the kids to go back to school. I will very soon be unemployed and am looking forward to spending some of the summer with my kids. I liked this because one of my favorite people, my sister, is a teacher. The chalkboard is new, too, and was really fun to play with. And since there was still some lined notebook paper leftover from the school year, it provided the perfect background dp. This this a sketch challenge - Valerie creates some awesome sketches for us to use! Her hard work makes for easy inspiration for us DT members. Be sure to visit the MSB blog for all the details. 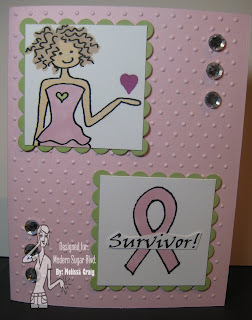 I used Pink Pirouette (I'm really going miss that pink) that I embossed with Swiss Dots Cuttlebug folder, I altered the original digi by cropping the awareness ribbon that is above the doodle-girl's hand so that I could make it bigger and added a little heart in it's place. She's colored with Prismacolor Markers. I then finished the card with big bling! I have to laugh, it just occurred to me that this entire blog post is dedicated to my sister Theresa... the school teacher... the breast cancer survivor. So Theresa, I applaud you for your accomplishments. Thanks for visiting me today! See you tomorrow. Happy Friday everyone! Actually it won't be a very happy Friday for me. Today is the day where we lose 94 hourly employees and 10 salary employees at work. The countdown also begins for me, I'll have 2 weeks remaining. So very sad. But on a happier note, as promised Hollyanne is once again the Friday Feature. This is her in her Jazz costume. The image is a Changitos monkey - such a simple design with so much personality. I'm not sure where the paper is from, but it's way cute!! I ran Tempting Turquoise thru the Cuttlebug with the Spots & Dots folder. I modified the sketch a little, but it works for the card. Levi helped by cutting the prongs off of the swimming suits brads and then putting pop dots on them and placing them. He decided that was how he was going to contribute. I missed the mark on the challenge that was set by the hostess which was a creative fold - but I think she'll forgive me. Hi Everyone! I hope you're all doing well. I can say that I am fully recovered from the recital - I'll have the last picture to share with you tomorrow of Hollyanne in her Jazz costume. 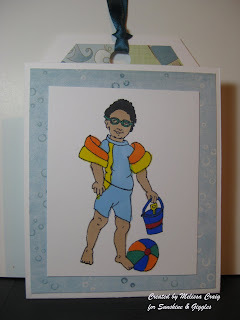 The card I am featuring today is an image from Inktegrity by Joni. You can purchase these adorable digis from Joni's etsy shop here. This little guy is so cute and you can just see in his face that he's very content at his little fishing hole. Please be kind in your comments, I hand drew the pond and it's not the caliber of drawing of Joni's - but I tried. The base is Neenah Classic Crest, the dp is from the cool paper that I featured with the turtles. Yep, same paper! Believe it or not. I colored the image with Prismacolor Markers and added a little bit of highlight with a white gel pen. The sentiment is from Down by the Pond from TGF and then finally little antique brads. 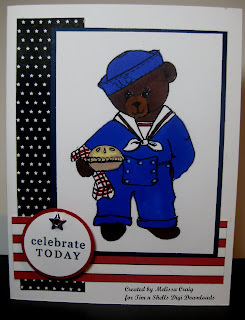 If you'd like to see some other amazing cards from Joni and friends - please visit the Inktegrity blog. And in case you didn't know, Joni is offering a super cute 4th of July image for free! Hi! I am almost myself. I went to bed early last night and I think I'm going to recover from the weekend's goings-on. Did you know that there are blogs that issue new challenges every week, daily? Did that make sense? OK, so I'm compiling a list of my favorite challenge blogs and when they post new challenges and I will share that with you when I'm done. 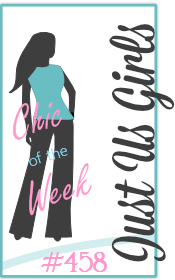 But to give you an example... Mojo Monday and The Pink Elephant are a couple of GREAT blogs that issue new challenges on Mondays. Then there's Sweet Sketch Wednesday that has a new sketch challenge every Wednesday. And then another favorite called Friday Sketchers. Yep, you guessed it, new challenges every Friday! So it was time to do another card for Tim n Shells Digi-Downloads and I've been waiting to use this sweet image, which I adore, on the perfect card sketch. The Pink Elephant had one that fit the bill! I love it! This is my entry for TPE#20. This card reminds me of my friend Joni - her favorite color is orange. I just got this really fun paper from All That Scraps, so I had to pull the fun polka dots in on the turtles. Cute, huh! Not the traditional color of a turtle, but it's fun! I used Prismacolor Markers to color and used the same color on face and body, but then went back to lighten the color on the faces with the blender pen. I'm not super happy with the results, it caused bleeding. Humph! I also did all faux stitching, which I managed to make those stitches just as straight as I do on a machine. LOL Not!! I hope you enjoy my card and that it put a little smile on your face or a twinkle in your eye. Thanks for visiting me today! Hello! Yes, I am still recovering from the weekend. Recital is over for another year, my sisters arrived safely and enjoyed the show and will be heading back today. And it's the start of another week. 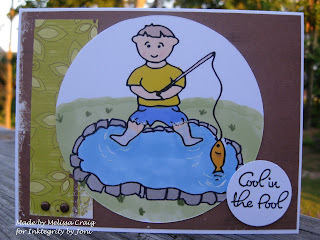 I have a card to share with you that utilizes the challenge found on Cute Card Thursday and one of the Sunshine & Giggles stamps. The challenge was to use a tag or make a tag - I made one. And isn't this little guy cute. He is ready to hit the beach with his water wings, wet suit and other gear. This is a picture of the inside. As you can see, to open you bring the flap down. The paper is double-sided and since both sides were so cute, I had to use both. Its from Imaginesce. I hope you like my card. Now, I know the rest of the DT worked hard to bring you great samples, too. Be sure to go visit them, leave them some love. Happy Friday! Happy Opening Night! 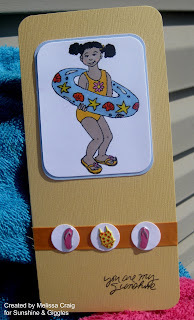 Today's Friday Feature usually features Hollyanne's cards - today it features Hollyanne. We had dress rehearsal last night and I was able to snap off a few pictures before the battery died. More later, I'm sure. Here's my beautiful daughter waiting to do her ballet dance, Twin Towers. This is the Finale costume (L) and I caught her in a stance and she says "but Mom, Finale isn't ballet!" Cute though, don't you think. The picture on the right is of Hollyanne and one of her friends posing in their ballet costumes. I didn't get to take a picture of her in the Jazz costume, but I will tomorrow night since I'm dressing room Mom and will post later. My sisters called and they're in Cleveland and they're stopping to sleep. They'll be here some time tomorrow afternoon. Oh! And I am so excited to announce that tomorrow is the Grand Opening of Inktegrity by Joni, the store. She's been busy drawing and uploading to her Etsy store. I've got some super adorable images to play with and hopefully I will be able to play and post on Sunday. Talk to you all soon. Thanks for stopping by. Hello everyone! I am SO EXCITED!! OBVIOUSLY I didn't pay attention to the description. When I opened this package, I was completely blown away!! I had no idea that I'd be receiving all these great stamps and they're huge! I expected an itty bitty set and I got THIS! Wahoo!!! This is fantastic! And I am faced with storage dilemma. So we had a bit of time before going to rehearsals last night, so I snuck in some play time. I went with a favorite color combo of mine. I am sending this to a friend of mine who needs a little pink pick-me-up! 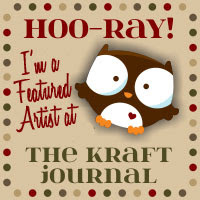 I also used a great sketch from Crafts 4 Eternity that they are featuring this week. I love this. I really wish I had had some natural daylight to photograph this card because this picture is seriously lacking the way cuteness to this. I'm mailing it off tomorrow, but will perhaps make another one. Thanks for stopping by. I'll not be around for a while now. Auto-post is ready to go for Saturday's challenge for Modern Sugar Blvd. I love that feature! Tonight is dress rehearsal, Friday night is the first show and Saturday holds two shows... AND my sisters and brother-in-law are driving all the way from Denver (1600 miles) to see the recital. My sister-in-law will be here, too, with her 3 boys, so it'll be busy around here to say the least! Hello! Happy middle of the week! I have a super cute image to share with you today. This is from my dear friend Joni's line of digi-images that she lets me play with! This image is called First Steps and although her store isn't running quite yet, it will be soon. You can visit her blog here for the all updates. Isn't this sweet! Big sister helping baby sister learn to walk. I just love this and their sweet little faces are priceless. I used Perfect Plum for my base. I also used Basic Black and Certainly Celery cardstocks. 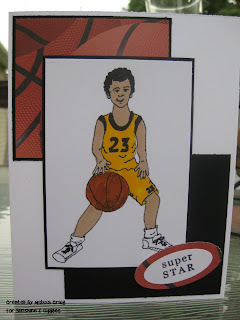 I printed the image out on Neenah Crest Solar White cardstock (the best!) and colored it with Prismacolor Markers. 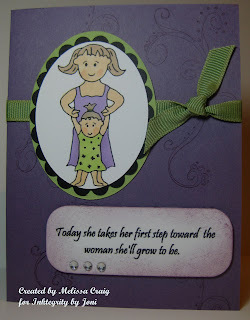 The sentiment is my own and says "Today she takes her first step toward the woman she'll grow to be." I added just a touch of ribbon and bling because every girl and girly card needs ribbon and bling. And no dp. 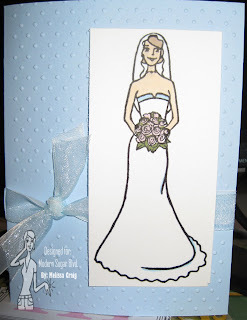 I used one of my old favorites from Stampin' Up! - Doodle This. It's been a long time since I actually held a wood-mounted stamp. I hope you enjoy my card and go visit Joni. Thanks for stopping by. Hi! Hope you're well today! Even though I am no longer on the Design Team for Corrosive Challenge, I am still going to try to play along every week. Janet posted a fabulous sketch for this weeks challenge. I paired it with a new digi company Tim n Shells Digi Downloads. This little guy is sooo cute! You'll see that I am totally lovin' the free digi-paper that GinaK is offering for free on stampTV. This has made it's appearance on my of my projects lately. 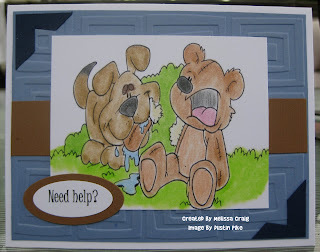 I colored the bear with Prismacolor Markers and highlighted a bit in each eye with white gel pen. 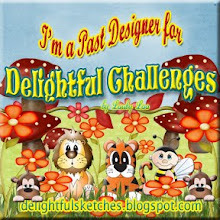 I hope you try Janet's sketch and check out Tim and Shell's adorable images! Hi! Happy Monday. I hope you all had an enjoyable weekend. I am supposed to participate in a challenge with the other DT members and link with them. I'm sorry girls, I know I'm not doing it right and I promise I will next week. It's enough that I am able to get this in with the busy week we have ahead of us! I do have a card to share with you. 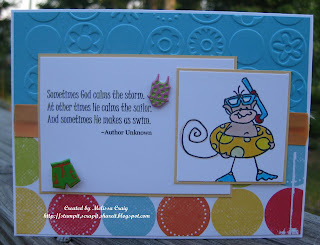 I used the currently featured challenge sketch from Card Patterns with one of the new Sunshine & Giggles stamps. What do you think? 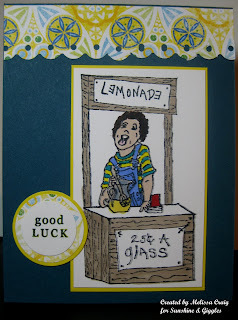 I think that there will be many thirsty customers in line for this little guy's lemonade! I used Not Quite Navy for the base. I did omit one part of the sketch that I'm sure you'll see if you take part in the challenge. 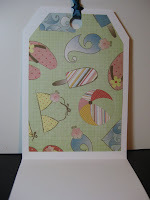 I also had a scrap of this great lemony paper from BoBunny. I colored the little entrepreneur with prismacolor markers. 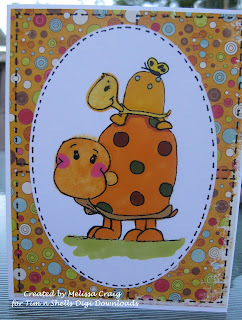 This is an easy card, super great sketch with so many possibilities and a super adorable image! Thanks for visiting me today! I first need to explain why my blog has been neglected a bit lately. This past week was VBS for the kids. Now, why will my blog continue to be neglected? Because today starts the horrific week of endless and everyday rehearsals for recital. I will do the best I can in stamping when I can and get it posted. I'm bummed, I even had a card ready for Friday Sketchers and I missed posting it in time. They've got another great sketch up though. This week's challenge for Modern Sugar Blvd. is to use the great garden image that just released and to make a #10 size card. The measurements are 7 1/2 by 9 1/4, score at 3 3/4. I found some old dp that I had stashed away, this being from Stampin' Up! distressed wood collection, and used it for my background. I colored The Potting Shed with prismacolor markers. Click on the link to see this image and the other wonderful garden images by our newest artist Pam West. I hope you join us in the challenge! Thank you for stopping by. OK, the release party starts soon! 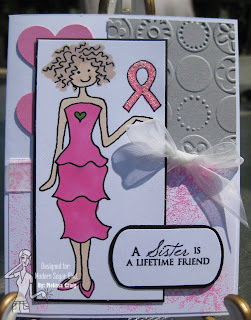 Here's my final sneak peek and this is a tribute to my sister who is a breast cancer survivor. I used a sketch that I found on Card Patterns. It's a great sketch - I turned it a bit. I also made it for the challenge group I belong to. The technique was faux webbing. I failed! I didn't like this technique - but I do love this new image. OK - see you at the party! Hi All, I've got another late post for you. Here's another project to share with you featuring another great digi that is being released tomorrow! Do you remember bomb pops? I loved these when I was a kid!! I remember staying at my Uncle Chris' house and me and my cousins would get to walk up to this little store for candy or bomb pops. Yummy! 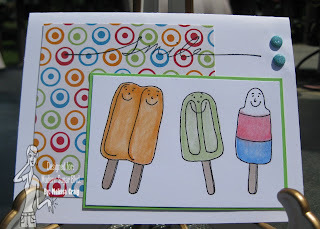 Now this popsicles image would put a smile on anyone's face! Aren't they cute! I had this fun dp left over from one of the monthly card groups and I added some sugared brads for a bit of fun. Be sure to stop by tomorrow night at Paper Craft Planet for the first release party! 9pm EST. There will be lots of chatter, fun and a BINGO game. I hope to see you there! There are some great new digi stamps coming from Modern Sugar Blvd. this week - in fact, the release date is June 11th! I'm a little late in posting, so I apologize. This week is VBS week for the kids and I re-arranged my work schedule, so I go in at 7:00 which leaves me no time to read email, do some blogging or blurfing! This is BBQ Momma and she's ready to grill up a storm for you! I created this table topper as a welcome for our cookout guests. The grill on the front is not an MSB image, I found it as part of a coloring page image that I edited and tweeked and added it to my project. The "Welcome" part is generated using a word program and a cool font. 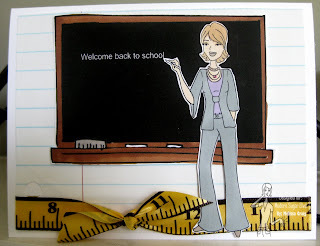 The paper I used is from a GinaK digi-paper pack that is free to her StampTV members. Stay tuned for more! Thanks for stopping by! BTW, my sister Karin, is the inspiration of this table topper. 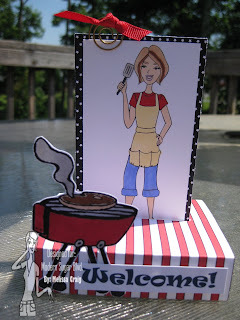 She sent the most amazing free-standing pop-up card that was her contribution to the monthly group cards for May. Her version is classy and cute and is a true card. My topper will not compress into a card since I permanently adhered it. Hello! Happy Monday! I am so glad you're here. I have the cutest image to share with you today. This is from the wonderfully talented Melyssa Connolly of Whimsie Doodles, but I know you've seen her work posted in The Greeting Farm gallery and other places, too. This woman has inspired many emotions in me... one of envy and jealousy because she's so darn good!! But mostly of inspiration because she's darn good! She now has her own digi-stamp company and has the most adorable images. I am very partial to the turtles - so so cute!! The layout I saw somewhere and for the life of me I cannot remember where! I will find it and I will give credit where it is due. It isn't exact, the way I remembered it, but still a great sketch! I've become a sketch junkie and I am so thankful that there are so many talented stampers out there that can come up with this stuff - I sure can't! This is image called This Buds for You and Melyssa is offering it for free on her blog. I had so much fun coloring this little sweetie. I used Prismacolor pencil and OMS. I LOVE LOVE LOVE Neenah card stock! It's absolutely wonderful for digi-stamping! Then I used a white gel pen (that I keep forgetting I have) to highlight a few areas. 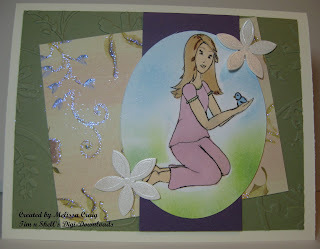 The paper is from Crate Paper that I purchased a while back from All That Scraps for one of my monthly card groups. I had a little leftover and it gave the softness to this card that I was looking for. I hope you enjoy this card as much as I do. I also hope that you go visit Melyssa... say hello, leave some love and try out her digi's. Happy Sunday! Sorry for the late post, but I've been busy busy busy!! My Sunshine & Giggles stamps arrived yesterday and the excitement level in my house raised a lot! My daughter had a friend over so she got to see the stamps, too. This girl grins from ear to ear when I show her my stuff and when she saw this sweetie, she says "she looks like me!" So I made this card with Kaylee in mind. 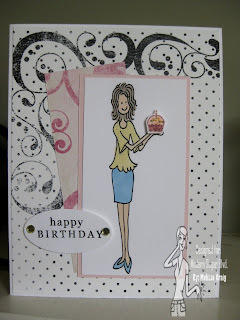 I used a fabulous Tami Mayberry sketch on CPS-Card Sketches for my layout. I am a big fan of Tami's. The image is called Pool Party and you can find her and friends here. Janice's stamps are unmounted, deeply etched red rubber. Many of us have EZ-Mount in our stashes but if not, here's a tip for you. Dip your finger into some water and wet the entire back surface of your stamp and then place onto your acrylic block. It works like a charm! It's time for another challenge at Modern Sugar Blvd.! Today's challenge features a lovely bride who is ready to march down the aisle. The challenge part of it is... Something Old, Something New, Something Borrowed, Something Blue. Visit Modern Sugar Blvd. for the details of the challenge. The picture is terrible, no matter how I tried to edit it, I could not get the color right. I apologize. Something old - we're pretending she's wearing Grandma's pearls, something new - the digi, something borrowed - ribbon I was given in a swap, something blue - the card. I hope you try out the challenge for yourself. Now something else that is very exciting to share with you. On June 11th, Modern Sugar Blvd. will have it's next big release!! Be sure to catch all the details on the blog, but there will be a release party on PCP and a Bingo game! !